it was early 80s, i was in 1st year at st margaret marys in castlemilk, and our teacher told us to go to the window because there would soon be a plane flying to east kilbride with a space shuttle "piggybacking" on it. we went to the window and sure enough it appeared. ive since heard there is a military airfield in e.k. can anyone shed any light on this? i know what i saw! was it challenger? I remember it too...almost the same sketch! I was in primary 7 when the teacher told us what yours did....and we saw it outta the classroom window....was excellent! I think it was "Columbia" in 1981..transported on a slightly modified Boeing 747 Not sure about the airfield in EK tho. Yeah I believe the 747 that carries the space shuttle is a modified ex-American Airlines passenger jet. Wouldn't have been in 1983 would it? I did a search on Airliners.net and the only photos of the Nasa 747 in the UK was in June 1983 after it had been at the Paris Air show. thank you all. i was beginning to think i had imagined it. I was in double history if my mind serves me right I saw it not a million miles from you glasgowgub in Kings Park Sec. It was doing a flypast over the Rockwell factory in EK. No landing sites for something that big though. Urban myth nonsense. I confirm this too - I remember one morning my mate at primary school said his dad had told him that the space shuttle would fly over glasgow. Our primary school was in Yoker, and the 747 and Shuttle flew almost directly above the school playground in an west to east direction. Actually had a discussion with a collegue a few weeks ago about this very topic and he said it was doing a flypast at the Rockwell Factory in East Kilbride, as they manufactured the special black tiles used on the underside of the shuttle body. Last edited by yoker brian on Tue Jun 08, 2004 5:34 pm, edited 1 time in total. i dont mean to sound like the grim reaper, but was it the same shuttle that crashed a few years later? Columbia was launched in 1981. One year later, the Shuttle Challenger rolled off the assembly line as the second shuttle of the US fleet. They were followed by the shuttles Discovery in 1983 and Atlantis in 1985.
yoker brian wrote: Actually had a discussion with a collegue a few weeks ago about this very topic and he said it was doing a flypast at the Rockwell Factory in East Kilbride, as they manufactured the special black tiles used on the underside of the shuttle body. Those tiles are amazing.. I saw a demo once - a guy in an asbestos suit super heated one of the ceramic blocks till it glowed WHITE!! Then, another guy in a plain business shirt and tie picked it up while it was still glowing red - it was completly cool to the touch on the outside !! We were all sure a trip to the burns dept. at Crosshouse hospital was on the cards then at that point for the guy!! 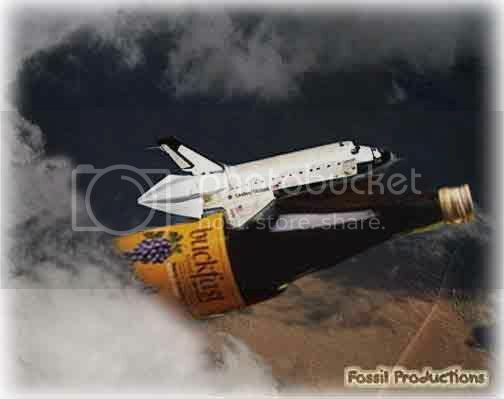 Buckfast - it gets you fleein'! Ha... Is there anything Buckfast can't do?